divine heart we are all known by name. 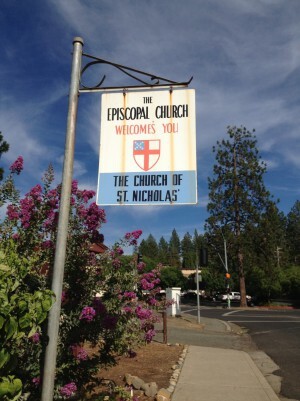 St. Nicholas' Episcopal Church located at 5872 Oliver Road, Paradise, California was founded November of the year 1951. The "little Red Church" was built in the late 1950s and used as a place of worship on "the ridge" in Paradise for forty plus years. In the year 2000, The Rev. Mark Allen led a team of parishioners and contractors to build what is now a beautiful new church building complete with stained glass windows from the little Red Church as well some new creations added by local artists. An immersion baptismal font was built near the entrance into the Sanctuary as a sign that entrance into the spiritual life is through baptism. The Altar furniture and cross on the wall was built by Michael Mundt, a member of St. Nicholas family. A church in which worship is lively and fun as well as reverent and holy; and we might be moved to dance and laugh; to be solemn or cry - people know how to pray and enjoy it - frequently and regularly, privately and corporately, in silence and in word and song. In 2006, the Rev. Ann Sullivan was called as the Rector. She was given a clear vision to develop a food ministry to feed the hungry people of surrounding communities by serving two lunches and a dinner each week. Currently 200-250 people are being served at each meal. There are Blessing Baskets of food given out every Friday. The ministries are called "Loaves and Fishes". A memorial gift was given for a kitchen upgrade to bring it up to town code. Linn Brownmiller led the kitchen remodel to "bring it up to code." Several parishioners began to plan and serve meals to our Paradise neighbors. 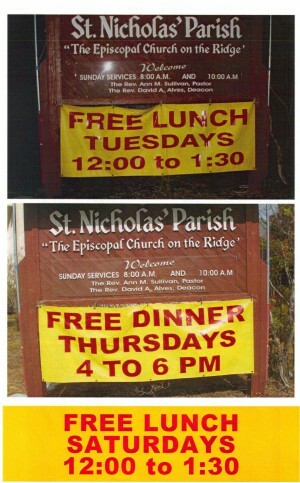 Now we serve 3 meals per week to 200-250 hungry people on the Ridge. 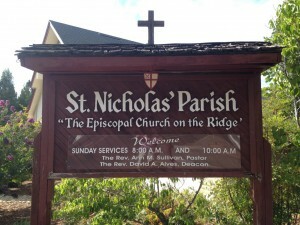 St. Nicholas' also has a Food Pantry which supplies 80 families twice per month with non-perishable groceries. Come and join us for Lunch on Tuesday, Dinner on Thursday, and Lunch most Saturdays!